authentic tool to produce a frothy cup of matcha. Traditional tool to measure the perfect amount of matcha powder. tea spoon for stirring your matcha when it settles. How to; Soak the prongs in cold water for a few minutes before each use, inspect the whisk and remove any broken prongs, add your favorite matcha powder then add hot water approximately 175f and whisk briskly in an "M" shape until frothy. Clean; wash under cold water, Gently rub the prongs to remove powder, Pat dry then air dry. Store; we recommend to keep it on a stand, If in container then keep in upright position and make sure it's 100% dry, and don't close the lid tightly. The shape of the whisk will change over time. The knot will open and straighten after each use this is expected, if using daily then replace it every few months. How to; start with use 2 scoops for every 2 oz of water and then adjust to your taste. Clean; wash with warm water or wipe with a damp cloth, dry thoroughly do not use soap. Store; keep in dry place, away from high heat. How to; When the matcha powder is starting to settle then mix it with the tea spoon. It all starts with natural bamboo - innovated and designed to perfection so every BambooWorx product is created with you in mind. ☕ HEIGHTEN YOUR MATCHA TEA EXPERIENCE Whisk up a delicious cup of frothy lump-free matcha with our Matcha Tea set and enjoy the authentic ceremonial Matcha tea experience. The HAND CRAFTED PRONGED WHISK produces the best crema and froth. The SCOOP measures the perfect amount of powder. The SPOON is for stirring your Matcha when it settles.  MATCHA TEA AT ITS BEST! Taste the difference! Conventional metal whisks leave you with bitter tasting tea. 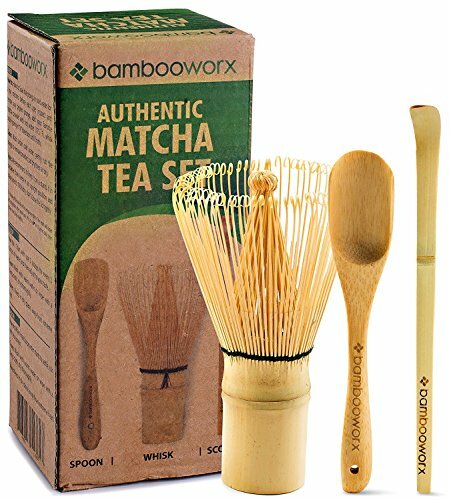 Comparatively, our bamboo whisk provides a much better, more delicious flavored tea. Our pronged whisk is engineered to create optimal agitation and it's crafted in the perfect shape to effectively whisk up a frothy cup of tea.  UNIQUE GIFT IDEA: The Matcha Tea Set makes a beautiful and useful gift. Impress your loved one by sharing a kit that allows them to prepare the most naturally beneficial drink in the world! Complete tea making and product care instructions are on the box.  100% NATURAL & FOOD-SAFE: The entire set is constructed of all natural bamboo. No mysterious varnishes or other chemicals were used in this product. It is made from 100% bamboo with a vegetable oil finish to enhance its durability.  STRONG AND SUSTAINABLE; The high quality makes it sturdy and durable. Its materials are 100% safe to use. This kit makes it very easy to adopt matcha as a lifestyle beverage. If you have any questions about this product by BAMBOOWORX, contact us by completing and submitting the form below. If you are looking for a specif part number, please include it with your message.